Furniture configuration, snacking set-ups and a DIY for the very best viewing experience. For the ultimate binge watching, movie night experience, comfort is key. But does your TV room really let you kick back and relax? If it looks like a traditional living room, probably not. So designer Steven Sabados broke all the conventional design rules and curated a room just for watching TV. 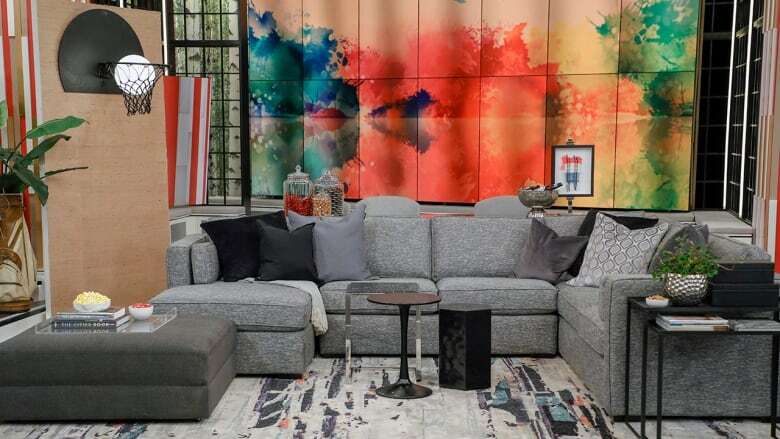 Here are his tips and tricks for furniture configuration, snacking set-ups, plus a DIY for creating the very best viewing experience possible. The most important factor for a space like this is that everyone should be able to face the TV, so Steven recommends opting for a home theatre sectional sofa. A big seating setup like this offers up enough room for the whole family and plenty of space to lounge if you're on your own. If you are in the market for a large-scale sectional, maximize your space by creating a huge customized sofa. 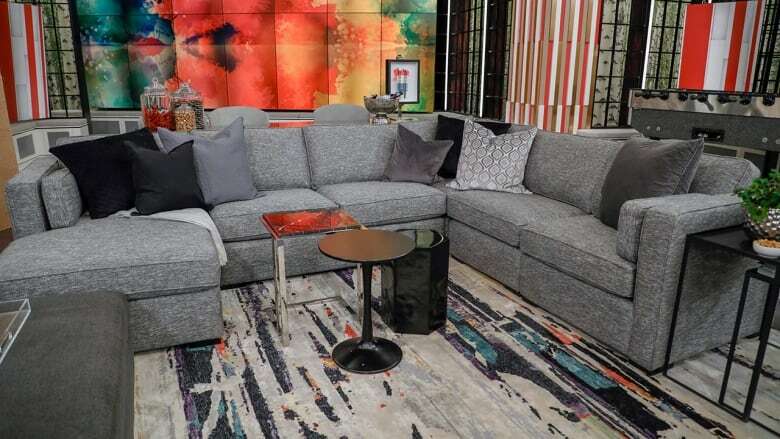 Modular pieces allow you to create a sectional that will truly fill the space. The nice thing about furniture like this is that if you do move or want to reconfigure the arrangement, it's often as simple as ordering one or two additional pieces to create two freestanding sofas. A TV room is meant for lounging and an oversized upholstered ottoman pairs perfectly with a sofa for the ultimate viewing experience. Pushed together, the two pieces can create an extra large space! So for a totally chilled out TV room opt for pieces that can be pushed, pulled, and moved around at will. 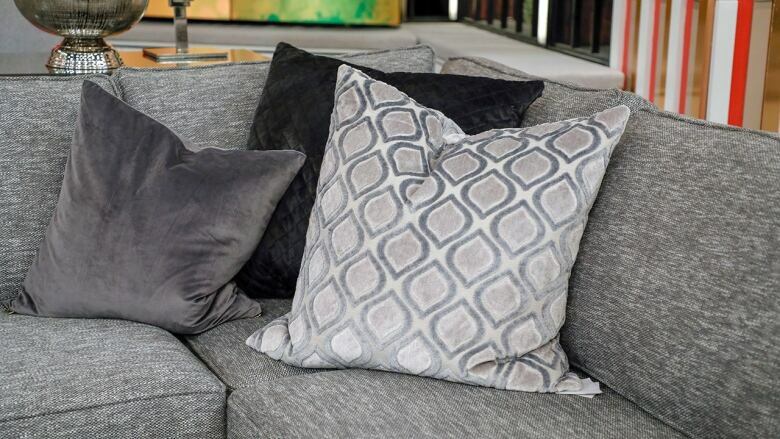 Large pillows can come down off the sofa and onto the floor to create extra seating, so add in large-scale throw pillows for an extra practical space. Steven also loves the idea of a Euro bed pillow on a sofa for extra comfort during a long movie night. 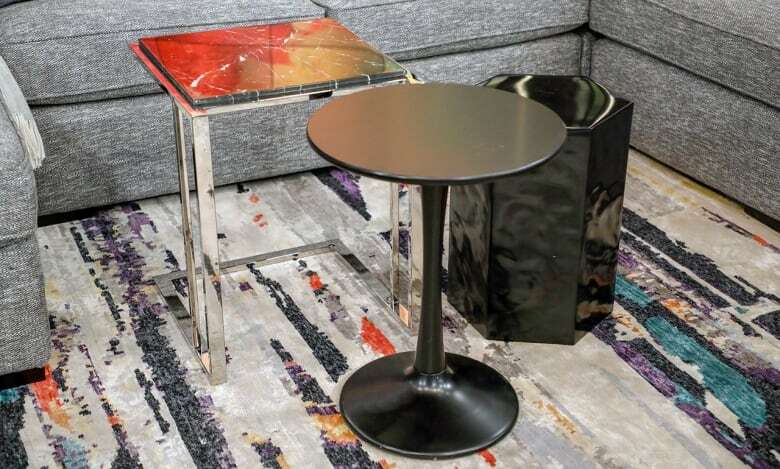 To create a relaxed space, scrap the coffee table and play around with a variety of drink tables that will give you more flexibility. 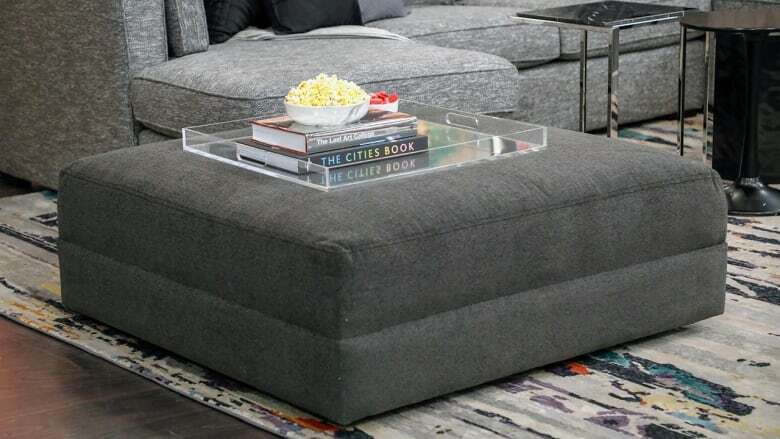 If the ottoman is in the centre of the arrangement, additional accent tables can easily move around to provide a place to put your drink down. Steven advises that if you're going to do something as casual and eclectic as this, ground the entire space in a large area rug, as shown above. Forget mom's rules, there's no need to miss one minute of the game if it's dinner time. Rather than have a sofa table backing the sectional, put a counter-height console behind the sofa with stools so you can sit and enjoy snacks as you watch. 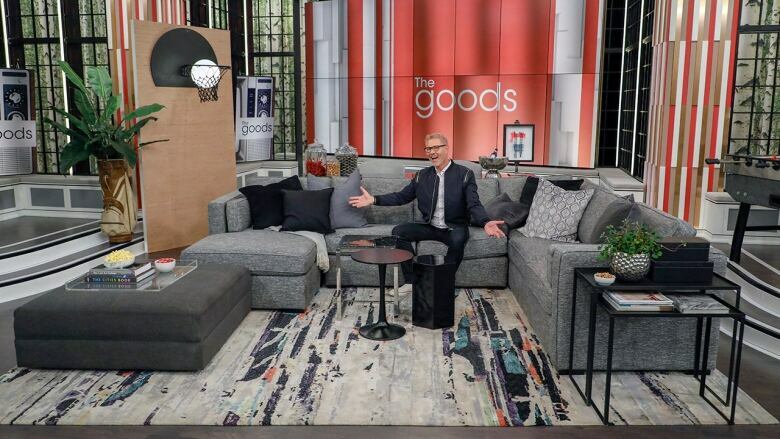 This keeps crumbs off the couch and a setup like this is perfect for a household of sports fans! Steven also suggests adding in jars of snacks for more delicious options. No one wants table lamps reflected in their televisions, so small directional pharmacy lights or pot lights on dimmers work wonders in a TV room. But Steven also came up with a fun wall sconce to help light up this space. 1. Spray the net any colour you like (Steven went with black). 2. Cut a 'backboard' out of MDF. 3. 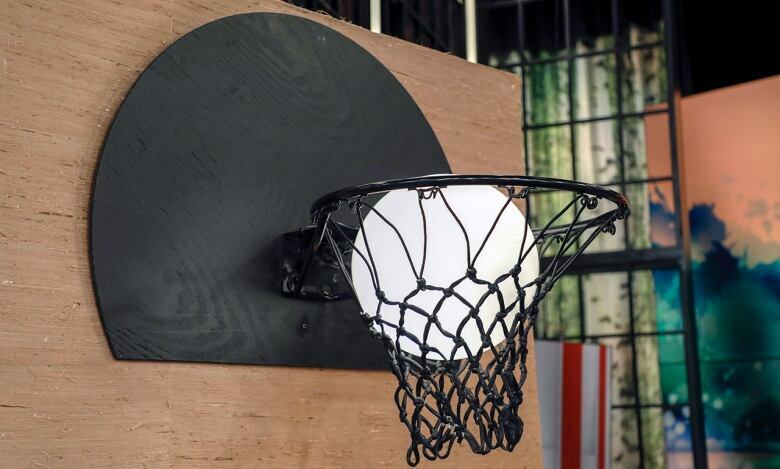 Paint MDF to resemble a basketball backboard. 4. Attach net onto the backboard using drill. 5. Hang the backboard on the wall. 6. Mount bracket behind netting to help hide it. 7. Attach the globe light to the mounting bracket. 8. Hardwire your light or run the cord behind the backboard to the nearest outlet. Not sure about how to hang your TV? The distance between your sofa and your TV should be two times the size of your TV (in inches). So if you have a 70" TV, you need to be at least eleven feet away. Height is far simpler to decide; just lounge on your sofa as you would to watch TV and hang your TV at eye level. Use a long piece of string to pull tightly between the wall and your eye line to make sure you're on the right track.